Only those students who audition at the beginning of each semester are eligible to be cast in our productions. Actors who are unable to audition during the normal audition period may ask for permission to set up an alternate time. 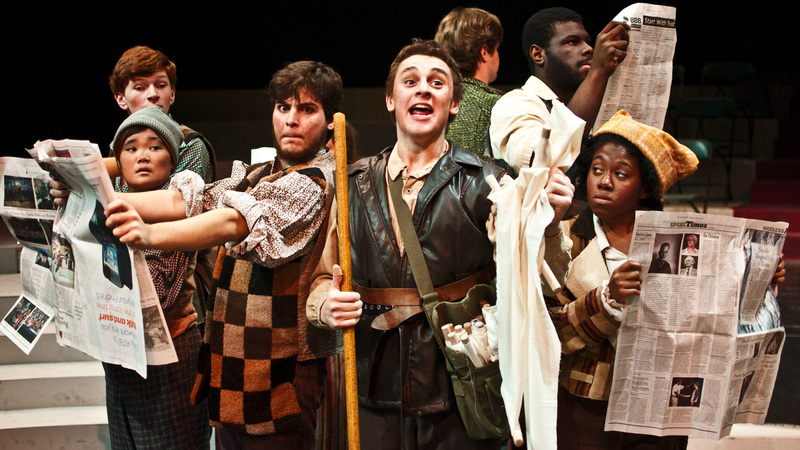 All theater majors and minors in the acting concentrations are required to audition each semester (when in residence) and are eligible to be cast in any production. We also strive to provide as many acting opportunities as possible for majors in acting concentrations. Casting is based upon the requirements of the plays, the quality of auditions, prior knowledge of the actors’ work, department casting policies, and work demonstrated in callbacks. The department actively considers gender, race, ethnic origin, actors with disabilities, and age range in the Season selection process. We always seek to have a diverse group of actors on our stages, and directors are expected to challenge assumptions about the given nature of roles in our plays. Here are a selection of monologues for POC and Non-Binary performers. Each semester begins with General Auditions. All directors casting productions for that semester are present for all auditions. Assistant directors and other faculty members may also view auditions. Auditions are typically held on the Thursday and Friday of the first week of classes, usually between the hours of 6:30 and 11 p.m.
Audition signups begin immediately after the General Meeting at the top of each semester, typically on the Wednesday of the first week of classes, at 7 p.m. in the JKB Mainstage. Seniors and juniors are required to sign up for slots on Thursday, allowing sophomores and first-year students more time to prepare for a Friday audition. An Audition Workshop is held immediately following audition signups (usually around 8:30 p.m.) in the Black Box Theater, led by a member of our acting faculty. This is an important opportunity for anyone who has never auditioned before to learn about how our process works. Suggestions and guidelines about our audition procedures will be discussed. All actors must fill out an audition form on the day of the audition. For Spring 2019, students are expected to prepare a 1 minute contemporary monologue in their age range, 16 bars of a song (without accompaniment), and 1 short joke. *If you are uncomfortable or unable to sing, you don’t have to. Any change to these audition requirements will be clearly announced. Here are a selection of monologues for POC and Non-Binary performers. And here is a folder of sides for both Men on Boats and Cabaret. Please download, print, and fill out our Skidmore Audition Form in advance. It is mandatory that you bring 11 copies of the form (double-sided if you write on the back) to auditions, along with a headshot or photo stapled to each one. Please be ready to hand your form and photo to the Stage Managers upon arrival. Auditions take place in the JKB’s Black Box theater. When called, the actor enters the room from the Green Room and introduces herself or himself. When introducing the monologue, the name of the play and playwright should be given as well as the name of the character being portrayed. When introducing the song, the title and composer/artist should be given. After completing the audition, the actor exits to the lobby. The entire process should take about four minutes. Questions should only be asked of the stage managers outside the audition space. At the end of the second night of auditions, the directors of the seminar productions post their callback lists (usually by 11:30 p.m.) on the first floor call board near the elevator. The callback list is also emailed to all auditionees. The seminar productions hold callbacks on the Saturday and Sunday following auditions. The location and length of the callbacks will be determined by each director, and clearly announced to auditionees. Typically they run sometime between the hours of 10am. and 5pm. At callbacks, actors may be asked to participate in activities such as warm-ups, improvisational exercises, script reads, and more. Directly after the Sunday callback, the seminar directors meet to determine their two casts. The stage managers and the assistant directors are part of this meeting. The department Chair often sits in. At the conclusion of this meeting, both seminar cast lists are prepared, emailed to auditionees, and posted on the call board with information about the first rehearsals. Once the seminar cast lists have been posted, the Lab directors determine their callback lists. The casting process is supervised by the Lab faculty supervisor. Lab callbacks are posted late on Sunday. Lab callbacks are planned for the following Monday and, if necessary, Tuesday (this depends upon the number of Labs). After the final callback, the Lab directors meet to negotiate their casts and final cast lists are posted. Playwrights Labs are cast after the Studio and New Works Lab casts are posted. Casting will be by invitation. In semesters when we produce a late-semester Director’s Lab, callbacks for that production will be held some time after the Studio Labs have been cast. auditions and casting in the Theater Handbook.